Stoner was born in Esher, Surrey, the son of cricketer Arthur Hallett Stoner. He won a scholarship to Bolton School (1911–1918) and then attended University of Cambridge in 1918, graduating in 1921. After graduation, he worked at the Cavendish Laboratory on the absorption of X-rays by matter and electron energy levels; his 1924 paper on this subject prefigured the Pauli exclusion principle. 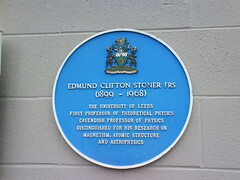 Stoner was appointed a Lecturer in the Department of Physics at the University of Leeds in 1932, becoming Professor of Theoretical Physics there in 1939. He did some early work in astrophysics and computed a limit for the mass of white dwarf stars in 1930. Most of his research, however, was on magnetism, where, starting in 1938, he developed the collective electron theory of ferromagnetism. He retired in 1963. He is also known for his discovery of the Chandrasekhar limit before S. Chandrasekhar.